I'm in Thailand now. Before delving deeper in this new country it's a good moment to write about the last moments and feelings in India. After my stay in Arambol, I rode south along the coast for a while, then turned inland for a brief stop in Panjim, the capital of Goa, checked out a few churches in Old Goa and finally rode to Margao from where I took a train back to Mumbai. The train arrived at eleven in the evening and I had an exhilarating ride speeding through the night to my friend Gaurav's place 25 km north. A couple of days later I took a plane to Bangkok, Thailand. In Goa, Anjuna was another place where it would have been fun to stay longer. A network of small streets and dirt paths leading to both guesthouses and private homes created a fun alternative style village athmosphere. Paradiso was a cool club which would have been still better during season with a larger crowd and the main outdoor stage open. South from Anjuna the resorts started to become more polished and to look like a package holiday destination. My guidebook said that the more luxurious hotels would have been still further south, I didn't go there to check them out. Panjim was a pleasant small city, based on what I can say after spending just a few hours there. Old Goa is famous for its old churches which made it worth a stop, but otherwise it didn't have any life or identity of its own. India has many faces. One of them is misery, which is emphasized by the fact that luxury is also available for those who can afford to pay. You can almost see it in front of your eyes by reading this story written by a friend of mine. However, independent of the social class, Indians seem to be generally proud of their country. National flags are displayed prominently and the army is looked towards with respect. People have a competitive attitude towards China and are happy to mention that the population of India is predicted to surpass China during the next 20 years. The problems of overpopulation are not in their minds. Those with higher education are also quick to point out how much world-class research is done by Indians abroad. Indians love bright colours: fabrics, clothes, houses, temples, vehicles, everything is colourful. They are curious, which any traveler will immediately notice: stop anywhere, in particular outside major touristic centers, and you'll be surrounded by people, many people. Curiosity is complemented with hospitality — nowhere else have I been as many times offered tea, meals and places to stay. The hindus have a saying "Guest is God" and the way they follow it makes you humble. Finally, there's sprirituality which is present everywhere: during festivals, at religious places, in daily life. Since ancient times India has had gurus which have been drawing a large following. It continues still today, ranging from centers with traditions and long heritage to more controversial contemporary figures such as Osho. There are so many different religions living in peaceful coexistence and so many different sects of them in India that you can be certain to meet multiple different views. Unlike the Christian church in most of Europe or Islam in the predominantly muslim countries there's no one single powerful organization which will feed you its answer. You'll have to put your own thought into it. You can of course ignore the spiritual aspects if you like, but they might just draw you in. The biggest difference in India compared to the culture in Finland is the concept of a joint family. It's not only that three generations live under the same roof and cousins next door, it also means that you are what your family is and vice versa. Stay in line and you'll have the full family support through the hardships of life, but make your parents angry and you may become a social outcast. For example, marriages in India are usually arranged by parents instead of the young couple finding each other themselves. I met a man who was considering to flee with the girl he loved because her parents didn't accept the marriage, a tough choice. Most surprisingly, an Indian friend of mine told that love marriages are actually again in decline after a rise in the eighties and nineties. My only real culture shock hit during my stay in Jhankri, a small village in Rajasthan. My host, the primary school teacher about whom I wrote three months ago, wanted to introduce me to all his relatives and friends. To be more exact, he wanted that I introduce myself individually to everyone in hindi, which meant several dozen introductions during one day. It was a bit tiring but still okay. However, then he started putting words in my mouth, wanting for example that I personally invite his cousins to Finland because they were his family and now my friends — people I had met just five minutes ago and barely remembered the name. I tried to be polite and play along, but it was a clear clash of cultures. I'm generally happy to welcome people at my place but it's my choice when and how I decide to issue the invitation. I spent three and a half months in India but still feel it wasn't enough. In Europe, Romania and Moldova were the highlights of this trip but India left an even stronger feeling that I need to come back some day. I started to love the chaos which somehow amazingly works. Being again out of the country will hopefully give some perspective of what really was important and what not, but my intuition tells me that India has still something in its treasure trove for me. I don't know how soon, but I'll be back. 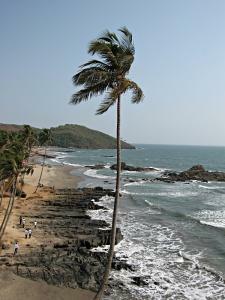 I reached Goa and stopped to enjoy the beach paradise at one of the northernmost beaches, Arambol. I rented a bamboo hut with a direct view to the sea, climbed on the hammock on the terrace and watched life on the beach while the sun slowly descended below the horizon. 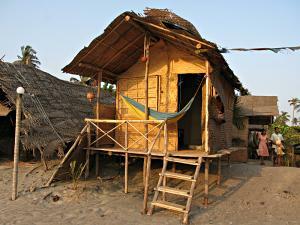 I was the only customer at Samsara, one of the groups of beach huts. I had complete privacy whenever I wanted but people to talk with, all the necessary services and live music almost every night just half a kilometer away in the center of the tourist village. Goa is India's smallest state and the most populated by foreigners. 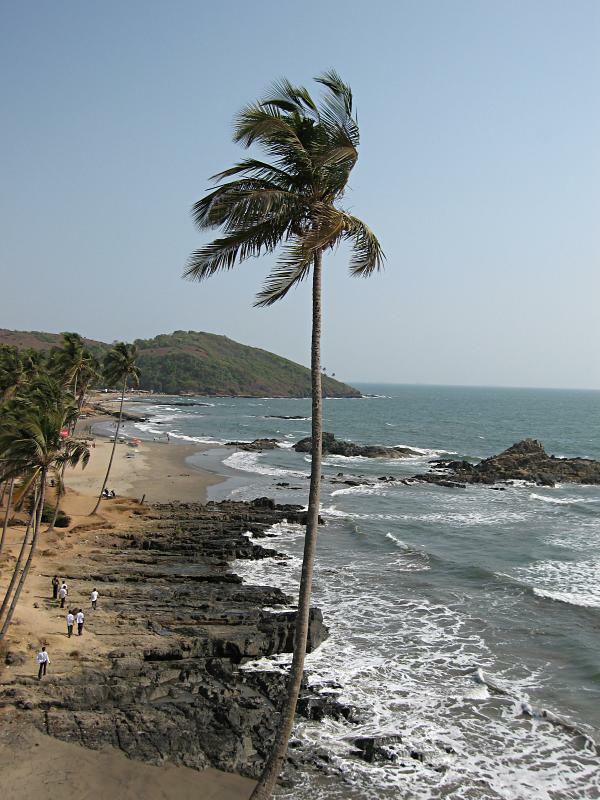 The difference between Arambol and the geographically similar Konkan coast I had been following earlier was striking. Less than 100 km up north I had been among natives, all signs had been written in local script only and often even mobile phone coverage had been missing. In Arambol the main road by the beach was lined with guesthouses, restaurants, travel agencies and touristic shops. There were more than a dozen Internet cafes for one kilometer of road. However, Arambol wasn't a line of polished faceless luxury apartments and hotels like I had seen by the Black Sea coast in Romania and Bulgaria. There were bamboo huts, a mix of newer and older slightly cramped buildings scattered around and a happy chaos of haphazard signs and posters everywhere. April was already considered to be off season so it was easy to get rooms and negotiate good deals. The downside of off season was less choice in activities and music nights, but there were still enough people to keep the village alive. Many foreigners (and of course locals) had been staying already for several months or years which gave the place a relaxed feel. And as far as the weather was concerned, I had nothing to complain about: sunshine and temperature above 30 degrees, but a pleasant wind blowing from the sea. For the first couple of days I went for walks around the area, checking out the nearby sweetwater lake and a small shrine at an old banyan tree in the middle of the forest. Then I concentrated more on swimming, playing with the waves, reading, listening to music, thinking about what I want to do after this trip (I want to enjoy the summer in Finland but after that I don't know yet), meditating and relaxing. I thought I'd have a good opportunity to work on my writings and arrange my photos but time passed quickly and I didn't progress much with them. Due to the good availability of Internet connections I did catch up with some pending mails. Two days of my ten-day stay I spent at a big music festival, Big Chill Goa, which was held on another beach about 5 km from Arambol. Ten years ago Goa was famous for wild all night rave parties on the beaches, but then a law was introduced which banned playing any music through amplifiers after ten in the evening. According to a long-term resident, the attitude of the police raiding parties more or less killed the underground scene also a few years later. That doesn't mean that there wouldn't be any music any more, but it went to smaller scale. 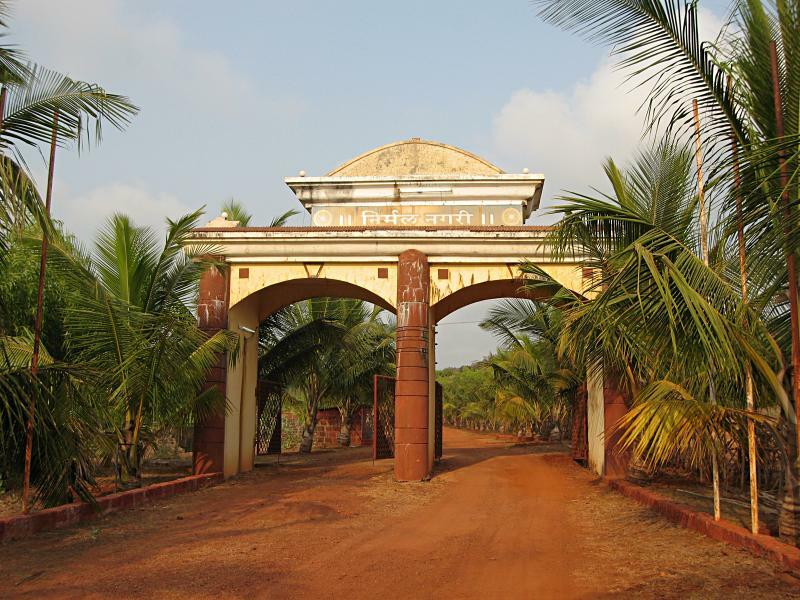 Also, Arambol apparently never had been as active in the party scene than some of the more southern resorts such as Anjuna, which should still have several clubs to make partygoers happy. Big Chill Goa was a British commercial undertaking to create a big outdoor festival again, adhering to the current laws: they really did stop the music before 10 pm both nights. The main stage was set up just away from the beach under palm trees creating an atmospheric arena with enough shade and a cool breeze coming from the sea. There was a dance stage with generally faster music and less shade, and a chill out area with guitarists, singers and dj's playing ambient tunes. The overall atmosphere was laid back and the music matched well with the surroundings. People were dancing without shirt on, many were smoking and/or drinking but I didn't see anybody getting too drunk or stoned and start disturbing others. It was possible to roam around freely between the festival area and the beach — despite the strict wording at the back of the ticket and guards at the gates there weren't any intrusive body checks and even carrying your own water and snacks in was okay. The lineup was a bit too British but there were some Indian artists as well. The best of all was Sapthaakshara, a group of seven Indian virtuosos who put together an amazing show using just a few jars, drums and their voices. The Bays which was the final act on the main stage on Saturday was great too, and other groups I liked included Mad Professor, Jalebee Cartel, Raghu Dixit and Hexstatic. Coldcut, which was advertised as the top name on Sunday, didn't impress me too much. The total number of visitors was probably between one and two thousand people, less than the organizers wished but enough to make it feel like a festival. Due to the large tourist population, most of the restaurants in Arambol were serving a mix of western and Indian dishes. Italian seemed to be the western food of choice: almost every second shop advertised pizza and pasta. Restaurant Sea Breeze served delicious portions of muesli, youghurt, fruits and honey, filling veg-cheese sandwiches and great fresh banana juice — magnificent breakfast topped with a great view to the beach. Hotel Manjunath looked unattractive but did superb fish thalis, including rice, vegetables, pickles, two sorts of curry sauce and some freshly grilled fish for just 30 rupees (0.5 euros), unbeatable value for money. Loekie's cafe was only place with live music almost every evening even during off season (their food was okay too), and Psy Bar deserves credit for keeping up the goa trance beat all night long. Despite the low volume I heard they got visited by the police on Saturday so the mood on low on Sunday, but at least before that it was the place to hang around late, either dancing or simply lying on the mattresses, listening to the music and chatting with people. Next to Loekie's cafe there was a lady advertising Kerala style ayurvedic massages and treatments. I went for a one-hour full body massage which was very enjoyable. It got even better when combined with Kirhi (or Elakizhi as it seems to be called in some other places), a treatment with cotton bags containing a hot herb and oil mix inside. Although achieved using a different method, the resulting feeling was quite similar to that after a good Finnish sauna bath with vihtas, bunches of small birch tree branches which you use to hit yourself and other people in the sauna. Encouraged by the good experience I decided to try something more weird, Sirodhara, which consisted of lying on the back while cool oil was being poured on the forehead. I didn't quite reach the kind of deep relaxation advertised by some descriptions, but it was a pleasant feeling and satisfied my neverending curiosity. 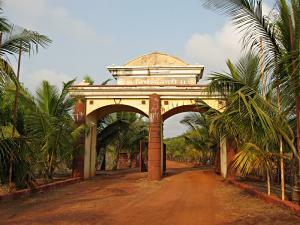 Goa is most famous for the beaches, but there are also some interesting places in inland Goa. My next step will be to hop on the bicycle again and explore some of them before saying goodbye to this country. I already booked a flight ticket to Thailand and have only one week left in India. I stopped for four days to relax and meditate in a Sahaja Yoga center at Ganpatipule by the west coast of India. There I was able to wake up several times before half past six without an alarm clock, which probably already sounds amazing to those knowing my usual daily rhythm. But before more details I'll tell briefly what happened after I left Pune. The first day when I continued my trip was said to be the New Year of the state of Maharastra. I didn't see any special celebrations while riding about 60 km south, but in the town of Khandala I was received kindly by the officer in charge of the government guesthouse. He said that I could stay at the guesthouse, I wouldn't even pay the modest room rate because I was his guest, and on top of that invited me for a dinner at his home. The meal consisted of several dishes made specially for the New Year, including different rice cakes and puranpoli, a kind of soft bread eaten by dipping it into a sweetish milk or cream based sauce. After Khandala I took a mountain road up to an altitude of about 1300 meters and stayed for a couple of days in hill station Panchgani. There my base was Ecocamp, a group of large tents set up in a stunning location overlooking the Krishna river down in the valley. The friendly owners of the place, a Canadian-Indian couple, lived in a house next to the tents. I rode my bike to the scenic spots surrounding the village, walked around a strange flat highland plateau called Tableland, and took a birds-eye view from a paraglider. The paragliding ride was fun but didn't match the experience of trying skydiving some nine years back. I guess I'd need to stay longer in the air and be in control of my own wing (as was the case during the skydiving course) instead of flying in tandem. From Panchgani it was still a short ride uphill to Mahabaleshwar, another hill station. The serenity of ancient temples in old Mahabaleshwar created a pleasant athmosphere and views were again impressive, but overall I found Mahabaleshwar less attractive than Panchgani. Without a vehicle the difference would have been even larger: Panchgani was small enough to walk around while a half-day sightseeing in Mahabaleshwar stretched to 30 km by bike in addition to the walks. A joyride down the western side of the hills brought me to the Konkan region. I turned right from the southbound highway at Khed and arrived to the sea coast a few dozen kilometers further west. Coconut palms were lining gorgeous beaches next to small, quiet towns and villages. Although mostly not marked in my map, a network of small roads winded up and down the hills near the coast. Traffic was minimal and the beaches far from crowded, many even completely empty. I had arrived to the most pleasant region in India up to now during my trip. The living standard of average villagers seemed to be somewhat better than in Rajasthan. They had nicer houses, more living space, and beautiful green surroundings provided by the nature. People were perhaps slightly more shy than their northern Indian brothers, but still very outgoing, helpful and hospitable. They were careful enough that I trusted newfound friends to go for a round on my bike, sometimes disappearing for a while with all the gear except the small bag of valuables which I always detach when stopping. Attempts to cheat or take advantage of a western traveller were completely missing. Nobody was begging or trying to charge "tourist prices" — many would even refuse to take a tip if I rounded up the bill in a small restaurant. After a few days of pedaling south along the coast I was approaching Ganpatipule and decided to try camping again. I set up the tent on a patch of grass with a sea view, went for a moonlight swim and cooked my dinner in solitude on the beach. Later I heard that swimming after sunset is not advised and that cobras also live in the bushes near my campsite, but I only met a large colony of ants and some flying insects. The main problem was heat: despite fully opening all the ventilation holes my high-tech two-layer tent was succesfully blocking the wind and keeping the hot air inside. In the morning I went swimming to wash off the sweat and bumped into three guys from the nearby Sahaja Yoga center. I had recently become more interested in yoga, partly through reading Autobiography of a Yogi which I had just incidentally finished previous night. The book was about a different school of yoga so I didn't have any previous knowledge of Sahaja Yoga in particular, but the people seemed sincere and I was in a receptive mood so it felt exactly the right time to give it a try. The center had actually been more active ten years ago. There was a big stage were ceremonies for several thousand people had been held, a couple of weeks ago such gathering with more than ten thousand participants, about one fifth of whom from abroad, had been in Pune. A few dozen people had continued after the big gathering to this more secluded place by the sea, and by the time I arrived it was less than twenty. Most were from Russia and Ukraine, the only Indians being the caretaker of the center and a couple of part-time helpers. There wasn't any fixed daily program, but people generally got up around six, did morning meditation either at the site or by the sea, had meals together, spent a lazy afternoon, went swimming a couple of times per day and gathered for a group meditation session around 8 pm. Sahaja Yoga is a completely non-physical form of yoga, there weren't any lessons and the group was small, so the program didn't need to be very organized. Sleeping was outdoors by the big stage; there were also bunks in a couple of buildings but it was nicer to sleep in the open air. During the first sessions I didn't feel anything special, but already during the second evening meditation there was a kind of vague sensation of energy. It was different from that suggested on the Sahaja Yoga web site (see also the Wikipedia page for a more objective take), but everyone I asked at the camp explained their experiences differently anyway. I got similar feelings a couple of times later as well, generally in the evening after a period of silence, not during worship which was also practised there. Whether there's anything divine to it is another question, and in particular worshiping the person who had founded the movement didn't feel like my thing. I don't have any plans for joining the organization, but as a technique for mind relaxation I'm planning to explore it further on my own for at least some time. Again trying to follow my intuition, I left the yoga camp after four nights. Only twenty kilometers later in Kotawade I met a group of happy people at a small village temple and joined a local festival dedicated to the monkey god Hanuman. The celebrations were a combination of old and new: there were long readings of prayers and traditional songs but also an outdoor disco and a film screening to entertain people later in the evening. Around a dozen people slept at the temple and I joined them. I also had the option of staying in a room at one of the homes nearby and my luggage had been taken there, but this time it didn't feel impolite to turn down the offer and stay at the temple instead. In the morning I woke up early, had some chai (milk tea) and continued my trip. 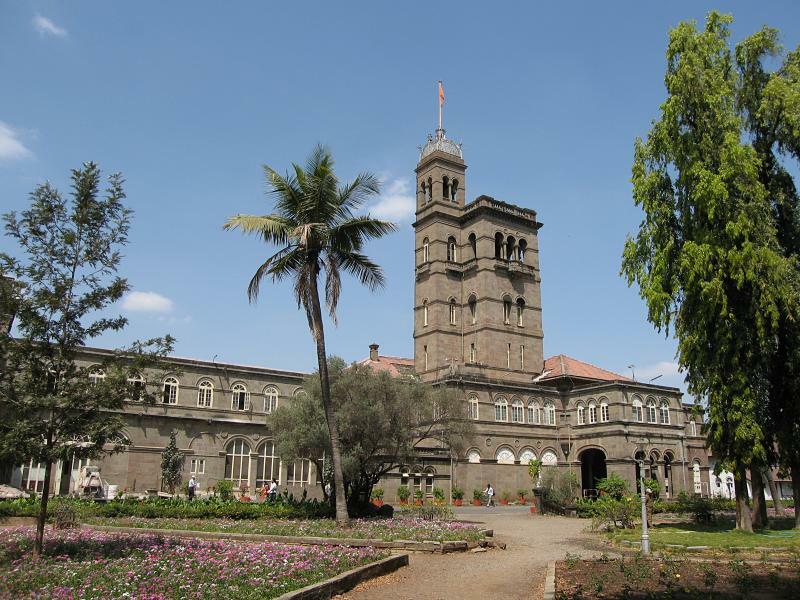 I came to Pune to visit my friend Helena, but as I was at the university campus it felt like a good idea to get in touch with people of my field. A couple of meetings were quickly arranged and it didn't take long before I was invited to give a guest lecture about grid computing, which I had been working on during my three years at CSC. I accepted and set aside a couple of days to catch up with the latest news and prepare a talk. The lecture was organized at the Computer Science Department, with students from a couple of other departments joining as well. There were about 60 people present, and their many good questions assured that at least part of the audience was interested in the topic. The announcement and my slides are available online. The following day I went still a bit more into technical details with people at the Centre for Development of Advanced Computing, which resembles CSC in Finland, and heard what they are doing in India. The discussions gave me also some perspective into the working culture in Indian universities and research institutes. It is easy for a foreigner to get involved as students generally speak good English, are welcoming and eager to meet new people. I didn't notice the Japanese kind of social pressure to not leave work before the supervisor, but at least Helena's friends in the National Centre for Cell Science did very long hours and spent also weekends in the lab. It might have been partly related to their field though, as they needed to check the results and take further actions at specific times after starting an experiment. For example the CS deparment, where you might expect nerds to code all night, got empty earlier in the evening. Organized free time activities and student parties seemed to be rare compared to Europe. A group of friends might decide to go out and you could always find a game of cricket on the fields, but bulletin boards carried job and course ads instead of party posters. Staying in the NCCS guesthouse on the campus was the closest to having a home since June 2006 when I left Finland. There was even a fridge in the room so I didn't have to think in the grocery store which items would get spoiled quickly in the heat. However, today I'm again loading my gear on the bike and returning to nomad life on the road. On Sunday I had the exhilarating experience of playing Holi. I got carried to a mud pool, soaked with buckets of water, painted all over with dozens of colours and had extraordinary fun the whole time. Due to apparent risks of carrying a camera in such event I don't have any photos of the best moments, but on the right you can see how I and my friend Helena looked like after the play. Holi is called the festival of colours, marking the end of winter. It's a two day event. Bonfires are burnt in the evening of the first day, symbolizing the triumph of good over evil. The main celebration begins in the morning of the second day, when people pour colour powders, paints and coloured water on each other, commonly called "playing Holi". Often friends play together but bypassing strangers are not saved either. For more details, special Holi foods and local varieties of the festival check out holifestival.org which tells all about it. 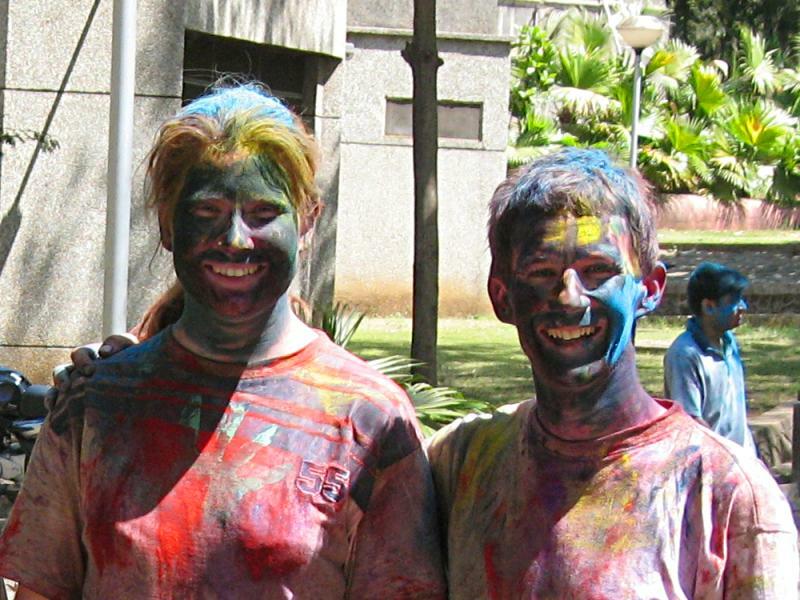 Holi is celebrated with greatest enthusiasm in North India, but the large student population in Pune also knows how to have fun. I joined the party with Helena, a Finnish girl whom I also had met first time at INSA in France — already the third INSA friend in India during just a couple of weeks. 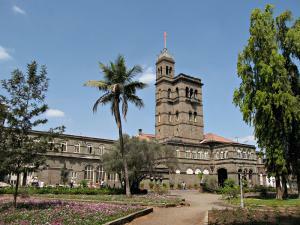 She was doing part of her research in the University of Pune so it was a natural choice to celebrate the festival there. Dressed in white T-shirts we had bought specifically for Holi we stepped out of the guesthouse around ten in the morning. They greeted us in the friendly Holi way: smearing colour on our faces with both hands, hugging and wishing "Happy Holi!". 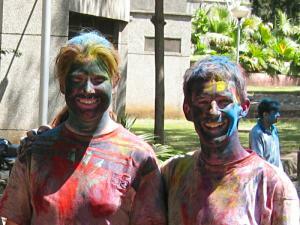 After the welcoming hugs someone asked in a playful voice: "You want to see real Holi? ;-)". A moment later we found ourselves in a small mud pool where apparently all our hosts also had been once. That gave a good base paint for our clothes, so we continued by applying more colours to make it look better, singing and dancing on the lawn. As the time passed more people came and were equally dragged into the group.